1 NAME The club shall be called The Chow Chow Club. 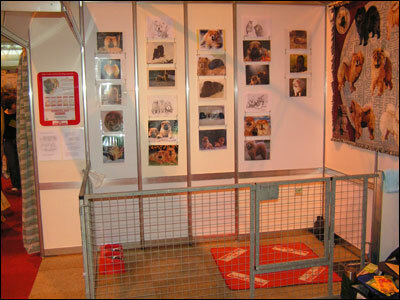 2 OBJECTS The object shall be to encourage the breeding and showing of Chow Chows by procuring classes for them at dogs shows, and to promote the interest and welfare of the breed at all times. 3 MEMBERSHIP The Club shall consist of a Patron, a President, not more than two Vice Presidents, and an unlimited number of members, whose names and addresses shall be recorded in a book kept for that purpose by the Secretary, which book shall be open for the inspection of the members on reasonable notice being given and shall be the property of the Club. 4 ELECTIONS OF MEMBER Candidates for membership of the Club shall be proposed by one member and seconded by another. The election of such candidates shall be vested in the Committee of the Club and shall be carried out either by those present at a Meeting of the Committee or a postal ballot to be conducted as follows: The name and address of the candidates shall be sent to every member of the Committee, who shall be asked to inform the Secretary of his or her assent or disagreement within 7 days of the date of the letter. Failure to reply to be taken as an assent. (a) The Patron shall be elected at an Annual General Meeting of the Club and shall hold the office for life or until resignation. (b) The President, Vice Presidents, Officers and Committee shall be elected by ballot as hereinafter provided at every Annual General Meeting. Nominations shall be invited from a fully paid up members with the notice of the Annual General Meeting. Nominations in writing supported by the signatures of the two members and indicating the willingness of the nominee (who shall have been a member of the Club for the preceding twelve months) to serve in the capacity nominated must reach the Secretary at least 14 days prior to the meeting. Any nominations as an Officer shall be automatically deemed as a member of the Committee unless the contrary is indicated. If more nominations than the number of posts are received, a ballot will take place at the Annual General Meeting. A member shall have as many votes for each position as there are vacant posts. Votes will be counted at the Annual General Meeting by a Scrutineer appointed by the Committee. In the case of an equality of votes the Chairman shall have a casting vote or may decide in which the opinion of members may be taken. If the number of nominations is less than the number of posts the Chairman shall call for further nominations at the meeting. If the number of such nominations exceeds the number of posts to be filled a ballot shall be taken in such a manner as the Chairman shall direct. 6 OFFICERS The Officers of the Club shall be a Chairman, a Vice Chairman, a Secretary, a Treasurer and a Cup Steward. (b) Any member elected on or after 1st. November in any year shall pay the annual subscription, which shall afford membership for the remainder of that year and the ensuing year. (c) Subscriptions shall be paid to the Treasurer, not later than the 15th. Of December in any year. Every member shall receive notice that his or her subscription for the following year is due on 1st. January next. No member whose subscription is unpaid shall be entitled to any of the privileges of membership, and if any member shall fail to pay the annual subscription by 1st. March, the Committee shall have the power to erase his/her name from the list of members, but if the committee shall subsequently receive a satisfactory explanation, the member may, at the discretion of the Committee and on payment of arrears, be re-admitted to membership. (a) Club accounts : The financial year of the Club shall be from 1st. January to 31st. December. A banking account shall be opened in the name of the Club into which all revenue of the Club shall be paid, and from which withdrawal shall only be made on the signature of two or more officers one of which shall be the Treasurer. The accounts shall be kept by the Treasurer and presented to the members at each Annual General Meeting. Certification of the accounts must be carried out by one qualified accountant or by two unqualified individuals with accountancy experience. (i) To receive the report of the Committee on the affairs of the Club for the pats year. Such report to be presented by the Chairman. (ii) To receive the Accounts of the Club and report on its finances which shall be presented by the Treasurer. (iii) To elect the Officers and Committee of the Club for the ensuing year. (iv) To discuss only resolutions duly placed on the agenda as a result of prior notice given to the Honorary Secretary, with the exception of routine matters or those which, in the opinion of the Chairman are urgent. The quorum for an Annual General Meeting shall be six. The Secretary shall give not less than 21 days notice of any General Meeting. The Committee may at any time, and shall upon request in writing signed by 80 members of the Club specifying the business for which such a meeting is requested, summon a Special General Meeting. If within 21 days after receipt of such a request the Committee does not summon such a Special General Meeting, the persons requesting such a meeting may themselves do so. Such Special General Meeting shall have power only to deal with the business specified in the notice convening such a meeting. Members requesting a Special General Meeting shall deposit a sum of £5 at the time of the request, which sum shall be forfeited to the Club if, in the opinion of the next Annual General Meeting there is not sufficient cause for requesting a Special General Meeting. 9 MANAGEMENT The affairs and management of the Club shall be conducted by a committee which shall be composed of the Officers of the Club and 12 other members of the Club, who shall be elected as provided hereafter. The President and Vice President shall be ex-officio members of the Committee. The Committee shall meet as often as may deemed advisable, but at least once every four months. The quorum shall be five members. In the absence of the Chairman and the Vice Chairman the Committee may elect one of its members to take the place of the Chairman for that particular meeting. The Committee shall conduct the general business of the Club. It shall also have power to deal with any matter not provided for by the rules, provided that any such decisions are submitted to the next General Meeting of the Club. In the event of a casual vacancy occurring in the membership of the Committee, it shall have the power to elect to the vacancy any member of the Club. Any member of the Committee failing without cause to attend three consecutive meetings of the Committee when properly summoned shall cease to be a member of the Committee. No member of the Club while serving on the Committee of any other Club devoted exclusively to the interests of the Chow Chow, shall be eligible to serve on the Committee of this Club. If the Club expels any member of discreditable conduct in connection with Dogs, Dog Shows, Trials or Competitions, the Club must report the matter in writing to the Kennel Club within seven days and supply the particulars required (Kennel Club Rule C.3.a(7)). 11 ANNUAL RETURNS TO THE KENNEL CLUB The Officers acknowledge that during the month of January each year Maintenance of Title fee will be forwarded to the Kennel Club whether by the Secretary or by Direct Debit, for the continuance of registration and that by 31st. July each year, other returns, as stipulated in The Kennel Club regulations for the Registration and Maintenance of Title of Societies and Breed Councils and the Affiliation of Agricultural and Municipal Authorities, will be forwarded to the Kennel Club. 12 CESSATION OF EXISTENCE OF THE CLUB Should the Club wound up or cease to be a registered Club under these Regulations, a final statement of audited accounts with a record of disposal of the property of the Club shall be forwarded to the Kennel Club within six months and the persons named as Officers and committee of the Club on the last return furnished to the Kennel Club, will be held responsible by the Kennel Club for the proper winding up of the Club. The property of the Club shall be vested in the Committee, and in the event of the Club ceasing to exist, a General Meeting shall be called to decide the disposal of any assets, provided that all cups and trophies shall be returned to their donors or legal successors. 13 BALLOTS Whenever it shall be necessary or desirable to take a ballot of the members of the Club, voting papers in such form as the Committee shall prescribe shall be sent by post to every member of the Club, stating for what object or objects the ballot is required, and a date shall be appointed not less than 7 days from the date of posting by which the same are to be returned to the Secretary. Ballot papers not received by such date to be deemed void. 14 LIST OF CLUB MEMBERS The Club must send a list of members and their addresses to the Kennel Club with their Annual returns, and if so requested, make an up to date list available for inspection by the Kennel Club and members of the Club. 15 UNDISCHARGED BANKRUPT PERSONS No person whilst an undischarged bankrupt may serve on the Committee of or hold any other office appointment within a Kennel Club Registered Society. 16 GENERAL The Club shall not join any federation of Clubs or societies. 17 BREED CLUB JUDGES LISTS Registered Breed Clubs must produce a list of judges each year which must be submitted to the Kennel Club as part of the Clubs Annual Returns. The purpose of the Breed Club's Judges Lists is to indicate to interested parties those persons the Breed Club would support at differing levels of judging. Membership of the Club must not be a pre-requisite for inclusion in the lists. Judges Lists should be divided into A1, A2, A3, B and C defined by the Kennel Club. 18 VOTING Except where otherwise provided for by these rules, all questions arising at any General Meeting of the Club shall be decided by a majority of those present and voting. In the case of equality of votes the Chairman of the meeting to have a second or casting vote. 19 ALTERATION OF RULES No alterations shall be made in the rules, except at a General Meeting, notice of which includes details of the proposed alteration and shall be passed by two-thirds of the members present. Any alterations to the rules may not be brought into effect until the Kennel Club has been advised and approved the alteration. 20 FINAL AUTHORITY The Kennel Club is the final authority for interpreting the rules and regulations of the Club in all cases relevant to canine or Club matters.